Millions of men, women and teens suffer from some form of psoriasis, an autoimmune condition that can result in difficult symptoms ranging from chronic, itchy rashes to severe joint pain. Long-lasting relief is possible, and available right here at Berks Plastic Surgery! We offer a variety of treatment options for plaque psoriasis, psoriatic arthritis, and other forms of psoriasis. We can help you feel great in your own skin. 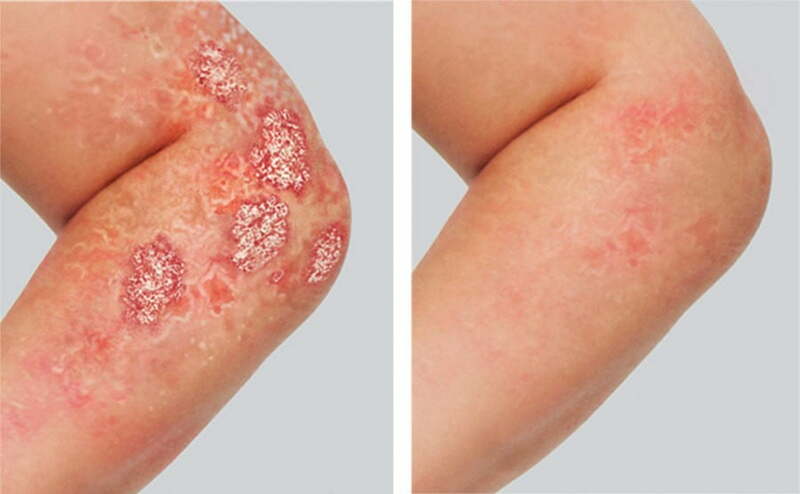 Psoriasis is an autoimmune skin condition estimated to affect over 7 million adults in the United States, and can cause a variety of painful and embarrassing symptoms, such as scaly, flaky skin, red, inflamed rashes, chronic itching, and joint pain. For many, this can lead to social isolation, depression, and alcohol dependence. If you are suffering from psoriasis, we understand how devastating this often very visible and uncomfortable condition can be. Our Dermatology Physician Assistant is experienced in treating even difficult cases of psoriasis and psoriatic arthritis, and offers multiple treatment options. Plaque psoriasis is the most common form of psoriasis. With this condition, the immune system produces too much of a protein called TNF, which tells skin cells to grow quickly and multiply abnormally. The excessive buildup of skin shows in the form of thickened, scaly, silvery or red patches called “plaques.” Plaques often appear on the knees, elbows, and scalp, but can affect any area of the body. In some patients, psoriasis can also affect the joint tissues, causing joint swelling, stiffness, and pain, as well as generalized fatigue. This is called psoriatic arthritis, and may or may not be accompanied by plaque psoriasis. We have had great success treating psoriasis with prescription biologics, such as Humira® and Enbrel®. Biologics are special medications containing anti-proteins that bind and inhibit TNF, and have proven particularly effective in treating autoimmune conditions. Both Humira and Enbrel are injectable medications. What does psoriasis treatment with biologics involve? After evaluating your skin and reviewing your medical history, we will determine the correct medication and dosage for your needs. Biologic injections are made into the front of the thigh, lower abdomen, or other instructed area—not in affected areas of skin or joints. Both products are available in pre-measured auto-injectors that eliminate the need for you to prepare a syringe or measure the medication. On average, biologics get very good results: plaque psoriasis patients typically experience at least 75% or more clearer skin within 3 to 4 months, and many achieve even better results. Before and after using Humira for 4 months. Individual results vary. Photos courtesy AbbVie, inc. When used to treat psoriatic arthritis, biologics often achieve a significant reduction in pain, swelling and stiffness within 2 to 4 weeks after beginning treatment, and any skin plaques typically clear dramatically within 6 months. It’s important to remember that every patient is different—biologics will be more effective for some patients than others. Also, these medications are not a cure, and you should continue dermatology care to ensure long-term relief. The most common side effects with biologics are injection site reactions, such as temporary redness, pain, itching or bruising. Additionally, these medications can suppress your immune system, potentially increasing risk for infections. To ensure your safety, it is critical to share your full medical history with our providers at your appointments, and notify us of any illnesses or side effects you may develop after beginning treatment. While biologics are our preferred treatment due to their effectiveness and safety, patients with milder plaque psoriasis may consider other treatment options first, such as topical creams and ointments. We are happy to accept new and returning dermatology patients at our Berks Plastic Surgery Westview office. For your convenience, we offer several evening and Saturday appointment times. Contact us today to schedule your consultation.